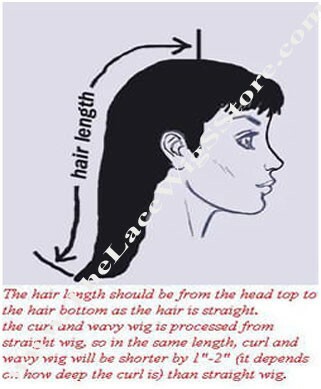 How can you measure the hair length of the lace wig on your head? See the below diagram - An example is if you are 5'5 an 18inch straight hair will fall 3inches past your bra strap, a 14inch wig will fall past your shoulders. Wavy, and curly hair are bit different and require an additional 2 -4inches to reach your ideal length. Contact us for more information on measuring the hair length of the lace wig or how to measure the hair length on your height and head. 1-888-875-9899, 1-416-619-7846, info@thelacewigsstore.com.